View of Undercliff in the Isle of Wight. 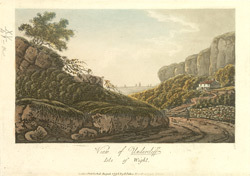 W. H. Davenport Adams describes the scenery at Undercliff in his book ‘The Isle of Wight; Its History, Topography and Antiquities’, published in 1862; “ The Undercliff is a region of such singular beauty and interest that we may even admit that it deserves all the praise which has been lavished upon it. Its interchange of rock and dell, of lawny slopes and leafy bowers, of rugged masses of cliff, of bare precipitous ramparts of glittering chalk, of rippling brooks and sleepy pools, of lanes winding in and about clusters of blossomy copses- with everywhere ‘the murmurous noise of waves’- renders it an enchanted land, whose beauties are continually unfolding themselves before our admiring eyes”.